David Clarke was the son of David and Clara Elizabeth Clarke of 914 Chester Road, Stretford, Manchester. He attended Manchester Central High School and O.T.C Manchester University. He became a Second Lieutenant and was killed in action in France and Flanders on Friday 22nd March 1918 aged 20. He was serving with the 11th (New Army) Battalion Cheshire Regiment in the Battle of St. Quentin. This was part of the great German offensive in Picardy in the spring of 1818. The country where the 11th Battalion was fighting was a waste of wire, trenches and shell holes. On the morning of the 22nd the Battalion was ordered to occupy a position near Chaufours Wood and on the road running south from Morchers, making a short attack with the help of tanks. Confusion reigned as the Battalion “came under orders” of five commanders in 24 hours and heavy casualties were caused by enemy shelling. David was one of these casualties. He has no known grave; his name is commemorated on the Arras Memorial in the Pas de Calais inscribed on bay 5 or 6. This Memorial commemorates over 35,000 casualties of the British, New Zealand and South African forces who died between Spring 1916 and 7th August 1918. It was designed by Sir Edward Lutyens. David was the uncle of the late Elaine Wood (a Civic Society committee member for many years) and Elaine’s mother was only 5 years old when her big brother died and knew nothing of the details. The only thing she had was a sketch he sent her 5 weeks before he was killed. Medal entitlement: - Victory Medal, British War medal. 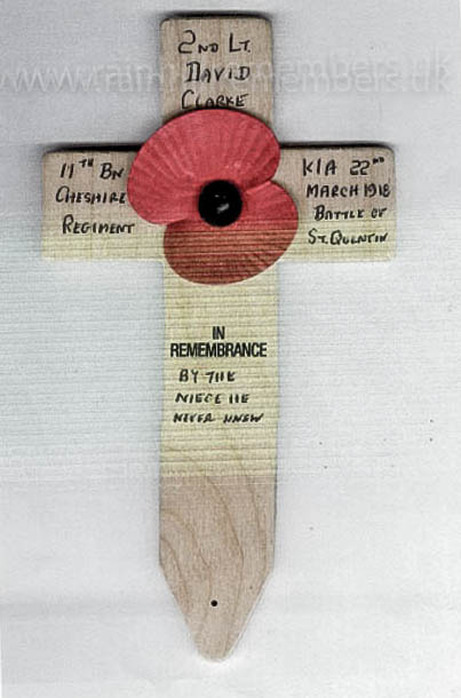 The wooden cross taken to France by Elaine and Malcolm Wood and laid at Arras Memorial.